The cell cycle is an ordered series of events involving cell growth and cell division that produces two new daughter cells. Cells on the path to cell division proceed through a series of precisely timed and carefully regulated stages of growth, DNA replication, and division that produce two genetically identical cells. 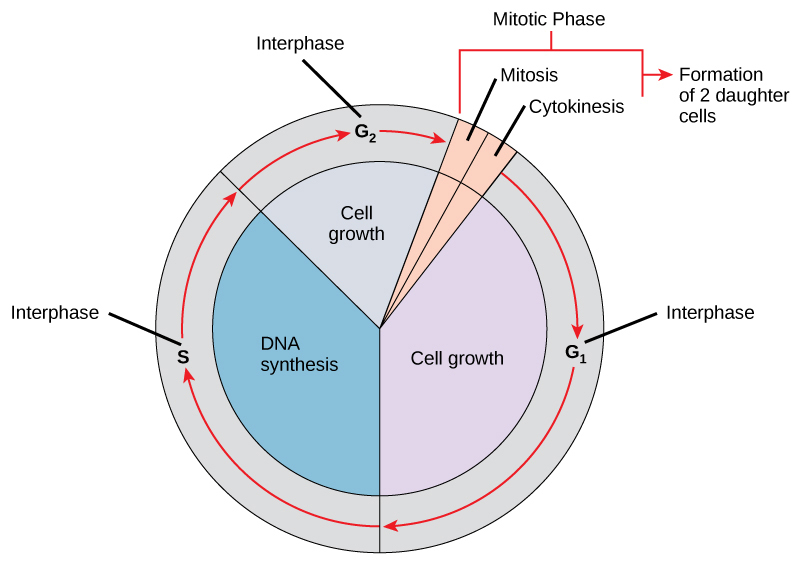 The cell cycle has two major phases: interphase and the mitotic phase (Figure 6.3). During interphase, the cell grows and DNA is replicated. During the mitotic phase, the replicated DNA and cytoplasmic contents are separated and the cell divides. Figure 6.3 A cell moves through a series of phases in an orderly manner. During interphase, G1 involves cell growth and protein synthesis, the S phase involves DNA replication and the replication of the centrosome, and G2 involves further growth and protein synthesis. 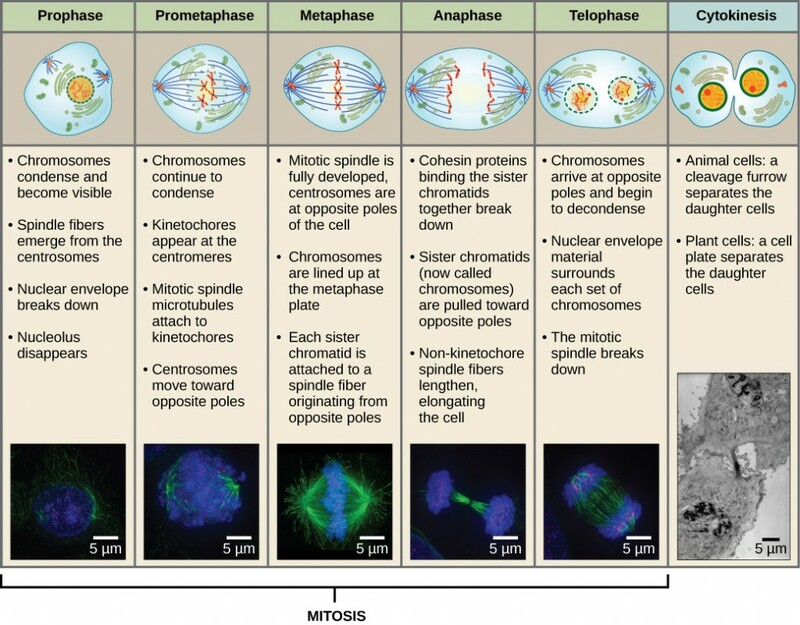 The mitotic phase follows interphase. Mitosis is nuclear division during which duplicated chromosomes are segregated and distributed into daughter nuclei. Usually the cell will divide after mitosis in a process called cytokinesis in which the cytoplasm is divided and two daughter cells are formed. Mitosis is divided into a series of phases—prophase, prometaphase, metaphase, anaphase, and telophase—that result in the division of the cell nucleus (Figure 6.4). In cells such as animal cells that lack cell walls, cytokinesis begins following the onset of anaphase. A contractile ring composed of actin filaments forms just inside the plasma membrane at the former metaphase plate. The actin filaments pull the equator of the cell inward, forming a fissure. This fissure, or “crack,” is called the cleavage furrow. The furrow deepens as the actin ring contracts, and eventually the membrane and cell are cleaved in two (Figure 6.5). 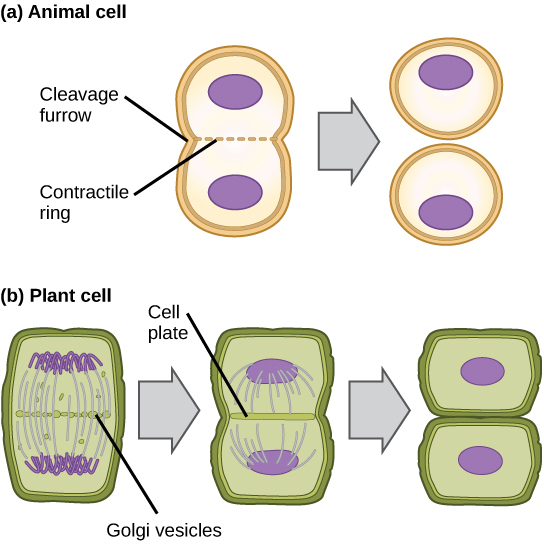 In plant cells, a cleavage furrow is not possible because of the rigid cell walls surrounding the plasma membrane. A new cell wall must form between the daughter cells. During interphase, the Golgi apparatus accumulates enzymes, structural proteins, and glucose molecules prior to breaking up into vesicles and dispersing throughout the dividing cell. During telophase, these Golgi vesicles move on microtubules to collect at the metaphase plate. There, the vesicles fuse from the center toward the cell walls; this structure is called a cell plate. As more vesicles fuse, the cell plate enlarges until it merges with the cell wall at the periphery of the cell. Enzymes use the glucose that has accumulated between the membrane layers to build a new cell wall of cellulose. The Golgi membranes become the plasma membrane on either side of the new cell wall (Figure 6.5). Figure 6.5 In part (a), a cleavage furrow forms at the former metaphase plate in the animal cell. The plasma membrane is drawn in by a ring of actin fibers contracting just inside the membrane. The cleavage furrow deepens until the cells are pinched in two. In part (b), Golgi vesicles coalesce at the former metaphase plate in a plant cell. The vesicles fuse and form the cell plate. The cell plate grows from the center toward the cell walls. New cell walls are made from the vesicle contents. 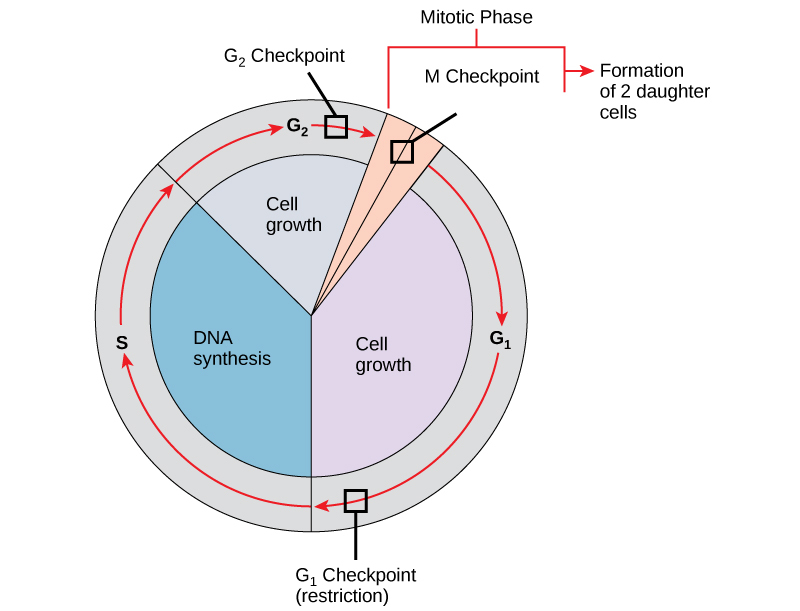 Not all cells adhere to the classic cell-cycle pattern in which a newly formed daughter cell immediately enters interphase, closely followed by the mitotic phase. Cells in the G0 phase are not actively preparing to divide. The cell is in a quiescent (inactive) stage, having exited the cell cycle. Some cells enter G0 temporarily until an external signal triggers the onset of G1. Other cells that never or rarely divide, such as mature cardiac muscle and nerve cells, remain in G0 permanently (Figure 6.6). Figure 6.6 Cells that are not actively preparing to divide enter an alternate phase called G0. In some cases, this is a temporary condition until triggered to enter G1. In other cases, the cell will remain in G0 permanently. It is essential that daughter cells be exact duplicates of the parent cell. Mistakes in the duplication or distribution of the chromosomes lead to mutations that may be passed forward to every new cell produced from the abnormal cell. To prevent a compromised cell from continuing to divide, there are internal control mechanisms that operate at three main cell cycle checkpoints at which the cell cycle can be stopped until conditions are favorable. These checkpoints occur near the end of G1, at the G2–M transition, and during metaphase (Figure 6.7). 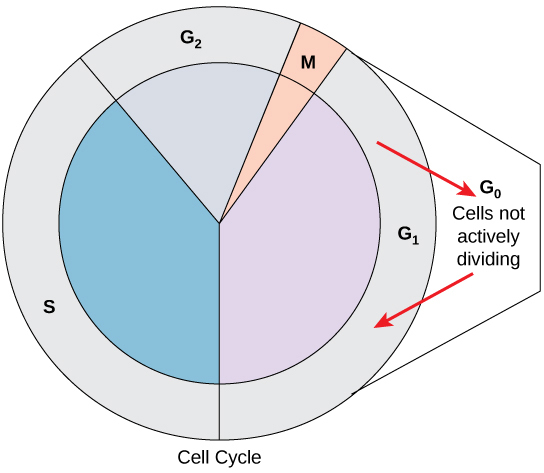 Figure 6.7 The cell cycle is controlled at three checkpoints. Integrity of the DNA is assessed at the G1 checkpoint. Proper chromosome duplication is assessed at the G2 checkpoint. Attachment of each kinetochore to a spindle fiber is assessed at the M checkpoint. D. The kinetochore becomes attached to the mitotic spindle. Sister chromatids line up at the metaphase plate. The kinetochore breaks apart and the sister chromatids separate. The nucleus reforms and the cell divides. 6.2 The Cell Cycle by Charles Molnar and Jane Gair is licensed under a Creative Commons Attribution 4.0 International License, except where otherwise noted.